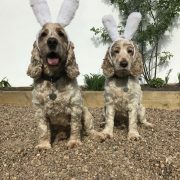 Ha ha very funny – we are NOT the Easter Bunny! Why on earth do our humans think we like to dress up, or wear silly things on our heads? The things us canines have to do in the name of love! We are no exception. 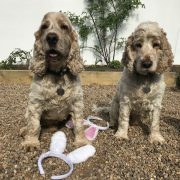 As soon as we saw two pairs of rabbit ears in the garden, we knew we were in trouble! That something was a rather delicious sausage. Mum could have dressed us in anything after that! We knew if we sat still for a couple of pictures, we would be well rewarded with our favourite treat. On this occasion the yummy sausage was certainly worth the embarassment of looking like complete fools, for a couple of minutes! We only hope none of our friends ever see this post!!! https://www.riponpets.co.uk/wp-content/uploads/2017/04/IMG_1400-e1491767061839.jpg 1200 823 janifish https://www.riponpets.co.uk/wp-content/uploads/2017/02/Logo-2-The-Pet-Shop-Ripon-e1487865902880-300x70.gif janifish2017-04-09 20:09:472018-10-21 13:36:31Ha ha very funny - we are NOT the Easter Bunny! 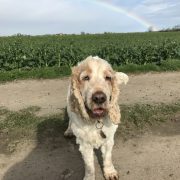 Last weekend, Archie and I took the humans for a lovely long walk round the fields in Thornborough. The weather was most peculiar. It was like walking in all four seasons. We were warm then cool, dry then wet and most definitely windswept! Archie and I found one puddle during our walk and of course had to have a little paddle. A paddle in a puddle! I even found some mud. There’s something joyful about being in mud, even the smallest amount. Mum was very pleased I managed to stay so clean (I don’t think she noticed my paws!). We saw some beautiful rainbows in the distance. 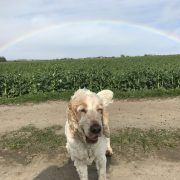 Archie wouldn’t stay still long enough for mum to take a photograph of him under the rainbow. Obviously I willingly obliged, in exchange for a biscuit! Until then, we will await more walkies another time! https://www.riponpets.co.uk/wp-content/uploads/2017/03/IMG_1271-e1490900709331.jpg 900 1200 janifish https://www.riponpets.co.uk/wp-content/uploads/2017/02/Logo-2-The-Pet-Shop-Ripon-e1487865902880-300x70.gif janifish2017-03-30 19:54:352018-10-21 13:36:51Rainbows and Muddy Paws! 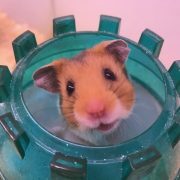 We have three rather cute hamsters in the shop at the moment. Apparently they’re called Syrian hamsters. Their litter mates have all gone to their new homes and these three are hoping to find theirs very soon. We’ve asked if we can take them all home but mum says no! Apparently with our prey drive it wouldn’t be fair. We don’t understand this at all! This is our favourite. She loves to hide in her castle and play peek a boo. Hamsters are very different to us (apart from their obvious size difference!) Whenever we arrive at the shop they are asleep. Why on earth would you be asleep during the day? Just think about the number of treats we would miss out on, if we did this! Yikes, it doesn’t bear thinking about. 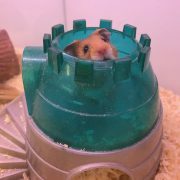 This little hamster loves his tunnel. Maybe if we pester mum, she could get us a big version! We are not allowed to help when it’s cage cleaning time, which is Dexters fault. He loves to climb in to boxes and when he did this in the box of shavings, he made such a mess everywhere. 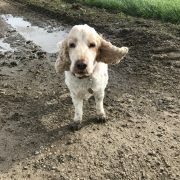 Mum did pull a very strange face – I don’t think it was a happy one! 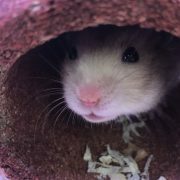 We have lots of leaflets about caring for hamsters, if any of our readers are interested. Just ask! https://www.riponpets.co.uk/wp-content/uploads/2017/03/IMG_1254.jpg 1756 1790 janifish https://www.riponpets.co.uk/wp-content/uploads/2017/02/Logo-2-The-Pet-Shop-Ripon-e1487865902880-300x70.gif janifish2017-03-15 10:28:112018-10-21 13:37:23Hamsters! We were not amused last week. 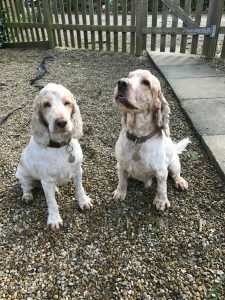 Firstly, mum rudely likened us to a couple of sheep, then we over heard words such as ‘groomers’, ‘haircuts’ and ‘bath’. At no point did we hear our favourite words like ‘treats’ or ‘biscuits’! As we were put into the car on that dreaded day, our initial thoughts were exciting walkies. However, it soon became apparent we were not going for exciting walkies, but going for very unexciting makeovers. From memory, this involved copious amounts of sweet baby smelling shampoo and sickly girly scented doggie cologne. We could hardly wait! We arrived at the lovely Kaths house. 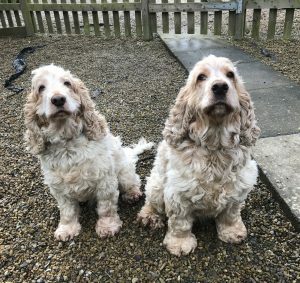 Mum thinks she’s lovely – we thought so too, until we were plonked into the shower! 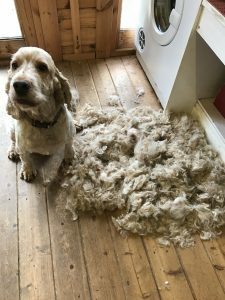 Two hours later there was a pile of orange roan fur on the floor and two rather unamused slimmer, shivering, bald Spaniels waiting to be laughed at by all the other dogs in town! https://www.riponpets.co.uk/wp-content/uploads/2017/03/IMG_1174-e1488822727649.jpg 4032 3024 janifish https://www.riponpets.co.uk/wp-content/uploads/2017/02/Logo-2-The-Pet-Shop-Ripon-e1487865902880-300x70.gif janifish2017-03-06 19:11:082018-10-21 13:39:39Haircuts! 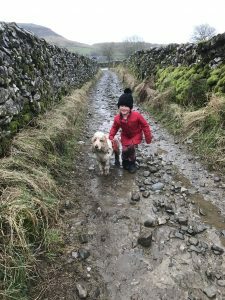 A Dog Walk in The Dales! 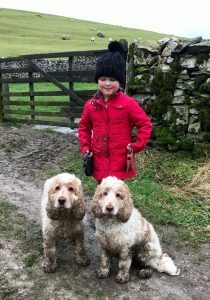 Last weekend, we had a trip to The Dales to see my brother and his family. Archie and Dexter are always very happy to see their human cousins. Inevitably it means extra pats but even better, extra treats! Harriet my 5 year old niece, was desperate to take one of the boys for a walk. She couldn’t remember their names, so they were renamed ‘red’ or ‘black’ according to their lead colour. Dexter the ‘red dog’ was the lucky one on this occasion! Harriet was such a professional dog handler and took her new role very seriously. Dexter seemed to recognise he had a very young lady leading him and took his role very seriously too! He trotted along so beautifully, in fact far better than he ever does for me! 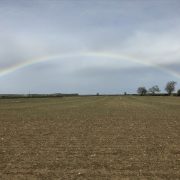 We walked from Austick to Feizor, across muddy fields and along even muddier paths. The whole walk was about 4 miles which was perfect on a damp chilly Sunday. A stop at Elaine’s cafe in Feizor was the icing on the cake, lovely coffee and rather delicious soup. Thoroughly recommended! 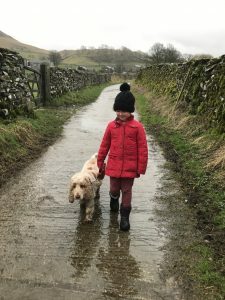 The weather got worse as we walked back down to Austwick and we ended up with two very muddy dogs (and an even muddier little girl). It was at this point Harriet decided her dog walking responsibilities were finished! 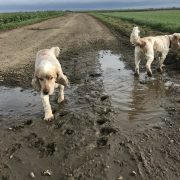 She did however suggest we put the dogs in her bath, which would have been an excellent idea, had it not been for the cream carpet we would have had to walk along to get there! Mum said we could both have a new bed (ours are falling apart – I have no idea why!!). I thought this one would be perfect but for some reason mum said no. https://www.riponpets.co.uk/wp-content/uploads/2017/02/IMG_1107-e1487885070330.jpg 4032 3024 janifish https://www.riponpets.co.uk/wp-content/uploads/2017/02/Logo-2-The-Pet-Shop-Ripon-e1487865902880-300x70.gif janifish2017-02-23 21:29:362018-10-21 13:38:48Product Testing! 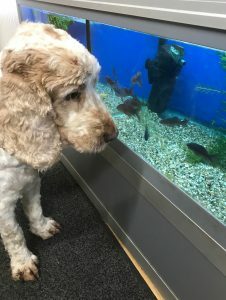 I love watching the fish. I think I do a really good job, making sure they don’t escape. My favourite are the Angel fish, they are so beautiful and so slow. I get more chance to study them carefully! I love my job as product tester. 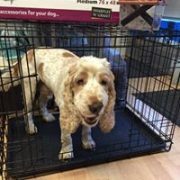 I got to try out the new dog crates the other day – without even being asked! 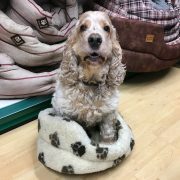 I was slightly surprised there wasn’t a soft fluffy cushion inside – if there had been one, I would have stayed ‘testing’ it all day!